Live music is about a lot more than what’s happening on stage. It’s about the chaos of the surrounding space, from the flannel-clad couple tonguing each other by the bar to the pained grimace stretching across the headbanger’s face in the corner. It’s details like this that help artist Brian Butler pull together the scene of a show. 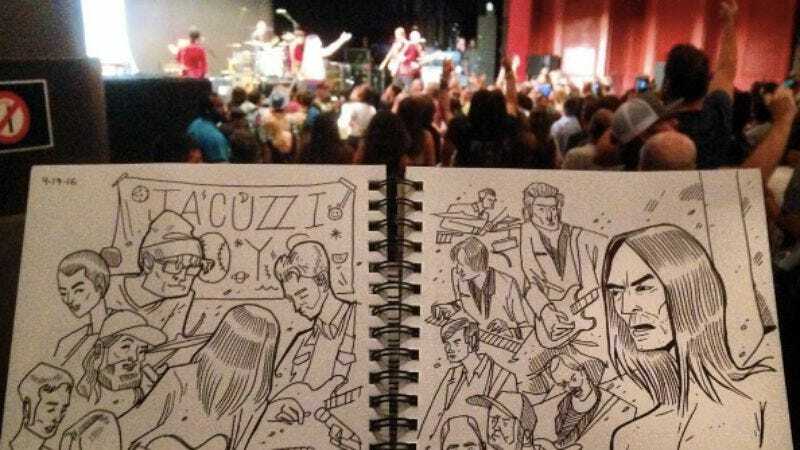 The Miami-by-way-of-Boston illustrator has been embedded in the music community for almost a decade, making show posters and designs for GZA, Jay Z, and Mötley Crüe, but his most eminent contribution to the music world is his Instagram account, which serves as a gateway to his never-ending sketchbook of shows. The sketches, which have grown into standalone Tumblr and Twitter accounts, mostly chronicle the clubs and weirdos of the Miami music scene. In one, Butler inks a serious-looking fella Instagramming a pineapple next to a woman pensively singing opera. On another page, it’s Florida lupine punks Wolf-Face who take the foreground, their absurdity coming to life in exaggerated strokes. All are presented as untouched—free of critique, the sketch existing only as confirmation that all the randomness happened in the same place. There’s something instantly relatable in the languid, claustrophobic scapes Butler inks. His drawings are a series of snapshots that bleed on top of each other and splash across pages, chronicling a sweaty night in the subculture in a way that words or photographs can’t. Butler also features his other work, like his graffiti murals and homages to Will Smith, but the bulk of the feed is devoted to his autodidactic chronicling of what happens when a band hits the stage. There’s an odd animation or two, but no photos, videos, or editorializing. That’s not really the point, after all.